Whether you are an educator, a concerned parent or an employee of a swim establishment, getting important messaging to the community about critical issues or anxieties is everyone’s responsibility. We at Splash take it very seriously. An alarmed community member recently asked the owner of Splash “why all of the messages regarding drowning’s?” The answer is very simple actually. When a grim occurrence happens in our town or nearby cities, it is our position to educate our community. People generally associated swimming as a fun, safe activity… and for the most part it is. However, assuming it is always safe and fun is the number one reason there are drowning’s or near drowning’s every single day. Swimming is only safe when the adults that are supervising are constantly watching and connected with the children they are monitoring, and this includes their own children in a comfortable, familiar environment. There is always a fake sense of security in grim circumstances. Either an adult is momentarily distracted or looks away to talk to another person, harmless at the moment but could potentially be deadly. Pool supervision is literally a life or death commitment. Even a member of our swim family are touched by near drowning circumstances, we are not exempt. One of our sons, who happens to be a strong swimmer and on a rec team at a different location, was swimming at a neighbor’s pool and went vertical. Some may assume that since he was a strong swimmer with many swim lessons under his belt AND a part of a swim team, he might not need to be watched as intently. Unfortunately, it happens. And it happens far to often. He simply got tired. He could have very easily been in danger. But as parents and partners in the pool area, we were watching and there were others in the pool that swiftly pushed him to the side to exit the pool and rest. On the walk home after the incident, the conversation was simple and not scary since he was only six years old. We were able to discuss what he would do if he got tired in the pool or body of water next time. A happy ending that we could use as a learning tool. An adult was watching the pool for all of the kids and remained in-tune and scanning at all times. There were adults in the pool in case a child needed help. No one panicked! You want to make sure no one (especially the children) would be afraid of the experience. When there are good rules in place, these events can be perfect for teaching lessons. There was a conversation that took place on the way home to reinforce what he should do in case it happens again. Keep following our Splash Blog. We are dedicated to educating and sharing with our community to increase awareness and safety for children and their families as well. 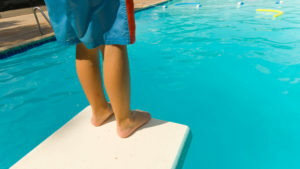 Please take your summer swim adventures as fun, but remember, in an instant it can all change.